Each frame is .1 second part. It is recommended that the reader refer to the previous 65 m and 110 m analyses. Rather than provide a frame by frame analysis, this interpretation will highlight generalities. There are several trends in the swimmer's stroke that continue from the previous analyses. Susan O'Neill's length of stroke backward is still shortening. Earlier in the race her arm extensions were more extreme. The elbow angle at extraction appears to be much greater at this stage of the race than at 65 m.
The shortening of stroke resulting from the abbreviated arm extensions, produces a more noticeable angle to horizontal, indicating that streamline has deteriorated. That change causes the knees to bend more to achieve a propulsive kick because the knees are deeper. Medial rotation of the upper arms is not as pronounced as at 65 m. That in turn produces a shorter propulsive phase and a less direct application of force with the hand/forearm surfaces. The arms on entry are not stretched fully forward nor do they commence as close together to initiate the outward scull as in early stages of the race. In both the breathing and non-breathing strokes the swimmer's feet break the surface at the commencement of the kick. 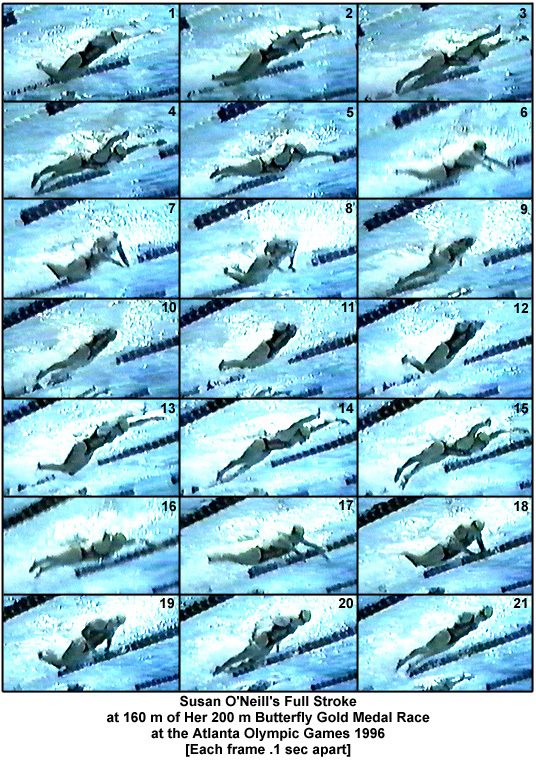 Previously, at 110 m, the feet only broke the surface on the breathing stroke. It is asserted that these factors result from accrued fatigue. "Shortening" of stroke length is a symptom of fatigue in all swimming strokes.